GameStop has delivered their promised Android tablets, with some flourishes. GameStop has delivered the Android tablets they teased earlier in the year, although the introduction came with a relative lack of fanfare. GameStop is selling several different Android tablets online and in 200 selected GameStop stores, apparently in a trial run before rolling them out to the entire store chain. The tablets offered, the Acer Iconia, the Asus Eee Pad Transformer, and the Samsung Galaxy Tab, have been pre-loaded with 6 free games: Dead Space, Re-Load, Sonic CD, Monster Madness, Riptide GP, Cordy, along with the digital Game Informer and the Kongregate Arcade App. The tablets are also offered on GameStop's web site, along with several other Android tablets (such as the Motorola Xoom) that don't include the game bundle. GameStop decided that they would not develop their own tablet at this time, but rather they selected several tablets they could pre-load with game titles to create a more compelling retail package. Asked about this, GameStop spokesperson Wendy Dominguez stated "GameStop is not developing its own tablet at this time. Instead, we have evaluated tablet offerings by established OEMs to determine a small assortment that makes sense for our business." GameStop is offering the Acer Iconia 7-inch tablet with 8 GB of memory for $329.99; the Asus Eee Pad Transformer 10.1 inch tablet with 16 GB of memory for $399; and the Smasung Galaxy Tab 10.1 inch tablet with 16 GB of memory for $499. Additionally, GameStop is offering a Bluetooth wireless controller for $39 that's certified to work with the three tablets offered. Queried about the the wireless game controller; GameStop had no additional specs beyond what was offered on the web site. Dominguez did have this to say about the controller: "GameStop's internal R&D team designed, developed and manufactured the controller. GameStop is first to market with a Bluetooth gaming controller that takes tablet gaming to the next level. We will continue to work with our publisher partners and independent developers to create immersive games that utilize the GameStop Bluetooth tablet controller." The controller is something that many Android tablet users might be interested in, but it's not clear if it will work with other Android tablets. "The controller was designed to work with the tablets we are offering and has not been tested on other devices," noted Dominguez. GameStop had no official word on when or if other tablets would be certified. The low-key introduction of these tablets and the wireless controller may be in response to the high profile of the Amazon Kindle Fire, with its $199 price point. GameStop's tablets are more capable, with extra features like HDMI output and Bluetooth, but they are significantly more expensive, too. It's noteworthy that GameStop has not rolled out their tablet offerings to all their stores just yet, but is testing the response first in key stores. They will probably wait and see if the Kindle Fire creates more interests in tablets, or if it takes all the interest in non-iPad tablets and leaves no room for other Android tablets to sell. This wait-and-see strategy is probably the best plan, given the high interest in Amazon's device and their marketing muscle. GameStop can wait and see what happens in the next few months, and adjust their strategy depending on what openings Amazon may leave for them. It means that GameStop likely won't sell a lot of tablets for the holidays, but once the Kindle Fire was announced at $199 GameStop had few good options. 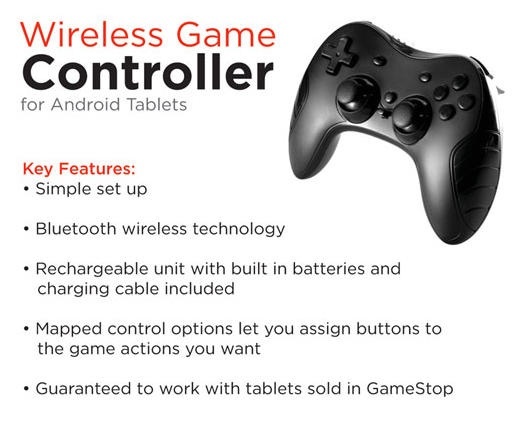 The wireless controller is actually the best selling point for GameStop's tablets, one that differentiates them from the same tablets elsewhere. If you've got a tablet with HDMI output, and a wireless controller, you've got yourself a console that's at least equal to a Wii in graphic power (given that these tablets have Tegra 2 dual-core chips in them). The advantage of these "consoles" is that you can easily take them on the road, and they're useful for quite a variety of things. The wireless controller addresses many of the complaints people have had about gaming on tablets. All that remains is for these tablets to get some of the popular console titles ported to them, and it's going to be an interesting competition for the family room. GameStop may or may not succeed with these tablets, but many people in the industry will be watching closely to see how they are received.